Happy Christmas everyone, I fancied a change from painting Heroquest so dug this little fellow out of my collection and painted him up quickly. it was sold as a store opening special at the Games Workshop Chester store back in the 80’s, although it was available more widely later via mail order and in my case ebay. His skin is base coated with Dark Fleshtone, then Dwarf Skin is applied followed by a Fleshtone Wash. Dwarf Skin is used as a highlight, and then Dwarf Skin mixed with Elf Skintone for the final highlight. Hair and beard, base coated with Cold Grey then dry brushed with mix of Cold Grey and Bleached Bone, another dry brush of pure Bleached Bone, then a lighter dry brush of Off White, and finally a very light dry brush of White. Santa’s robe is painted with a basecoat of Heavy Red, given a Black Wash and then layers of Heavy Red, Gory Red, Scarlett Red and finally Bloody Red. The fur trim was painted with Cold Grey then drybrushed with Stonewall Grey, Dead White was added to the Stonewall Grey and then finally a light drybrush of pure Dead White to finish. His boots and belts are base coated Black then highlighted with a mix of Black and Cold Grey, increasing the amount of Cold Grey for subsequent highlights. I varnished the belt with Vallejo Gloss varnish to give it the polished look. The belt buckle is Brazen Brass shaded with Umber Wash and then highlighted with Brazen Brass again. Santa’s sack is Heavy Brown shaded with Umber Wash, Heavy brown was used again and after that Earth to add highlights. The mace head and his chain mail shirt is Gunmetal, shaded with Black Wash, and then highlighted with Gunmetal, while the weapon handle is Earth shaded with Umber and then highlighted with Earth. The base was painted Cold Grey and then I mixed Army Painters Battlefields Snow with PVA glue in roughly equal quantities and spread it around the base with an old brush. 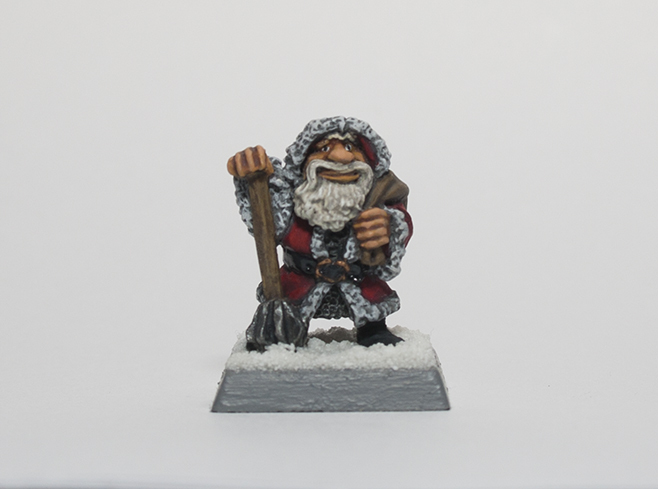 This entry was posted in Christmas, Dwarfs, Painting Guide, Warhammer Fantasy and tagged Dwarf, Games Workshop, LImited Edition, Painting Guide, Santa by Rob. Bookmark the permalink.